To add a new employee, first go to the “Team” page. There are 3 sub pages that will pop down. Choose the “Add/Edit” page. In the upper right corner there is a button labeled “Add new driver”. Click this button to add any new employee (this can be drivers, managers, dispatchers etc). A window will open to input employee information. Input their general information. 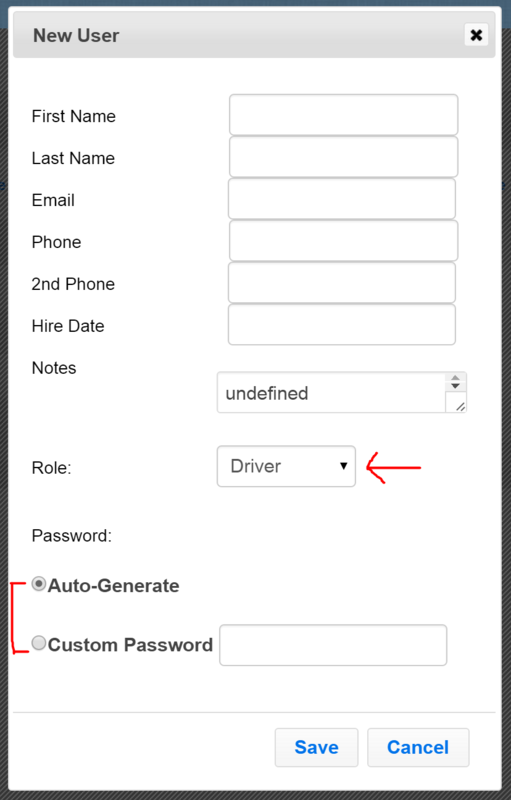 Using the red drop down box shown by the red arrow, choose whether this employee should have an owner account, driver account, manager account or dispatcher account. Please note: If you plan on dispatching trips to your drivers via email or SMS, you MUST fill in the email and phone number fields or SMS messages and emails will not be able to be sent. A username and password will be sent to them. You can have the system auto-generate a password for them to use or put in a custom password (eg ChangeMe1). Press save when you’re done entering employee information. You’ve now successfully entered a new employee. If you ever need to edit an employee’s information, please see our tutorial on Editing Employee Information.